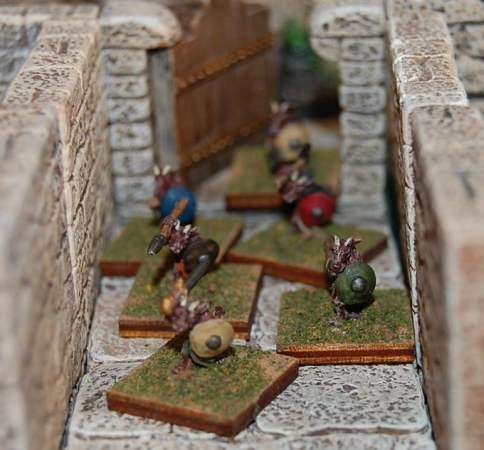 53 figures from Splintered Light Minis Goblins, Wererats, Orcs, Thieves, Adventurers and Dungeon Divers. 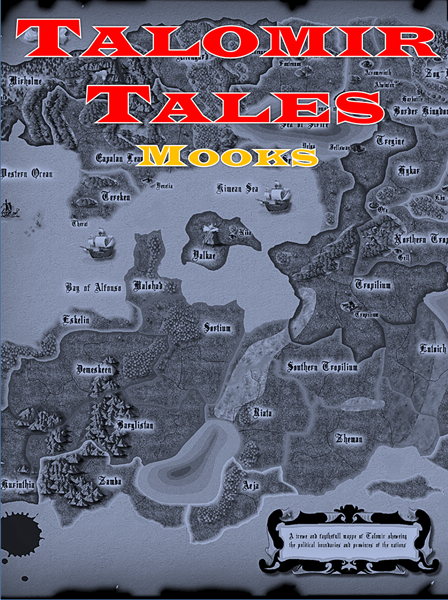 Had some free time and was wondering, can Talomir Tales rules handle larger battles and what would I need to tweak, if anything, to make it work. So I grabbed my copy of Distant Shores , the Talomir Core Rules and got started. I knew there were too many figures for the Battle Boards so I pulled out a TV tray (!) and placed some terrain on it. Distant Shores isn't concerned with movement distances, but more about actions. So when it's time to act, Casters cast, Shooters shoot, and melee guys charge into melee. 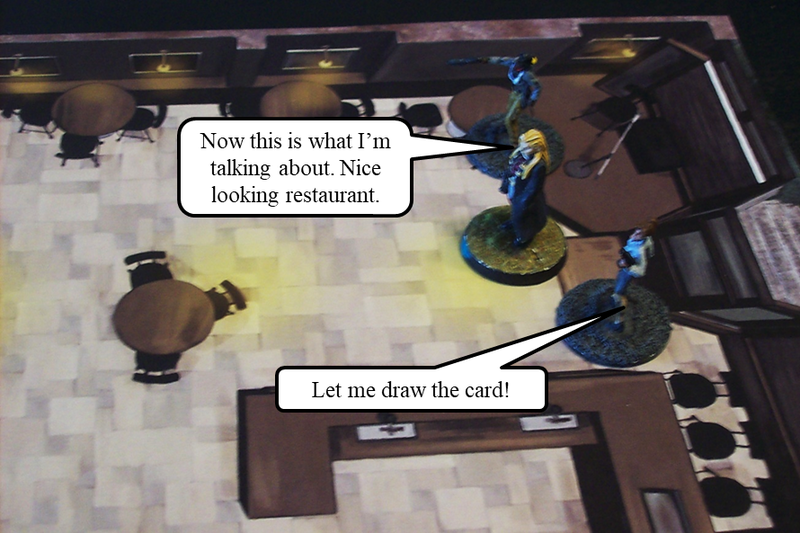 Here are the two opposing sides laid out on the table. I divided each side into three groups - Left Center and Right. 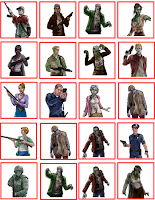 I decided with that many figures to divide each side into three groups. Each had a Leader and how large the group was, didn't matter. They would just function as a group, taking their actions separately. 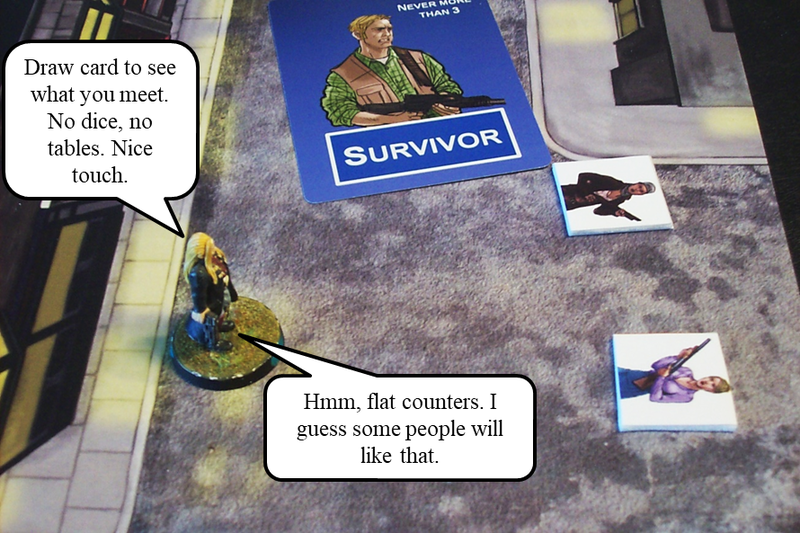 The first thing I did was roll for the Advantage on the Action Table. I rolled for each group - Left, Center and Right. Made sense to me that you'd be focusing on the enemy to your front so dividing the battle into three sections was the result. 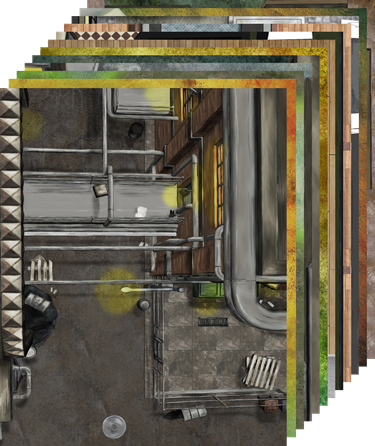 The Thieves on the left and the Dungeon Divers on the right of the human side gained the Advantage against the Goblins and Wererats respectively. The Orcs on the other side, had the Advantage over the Adventurers in the Center. 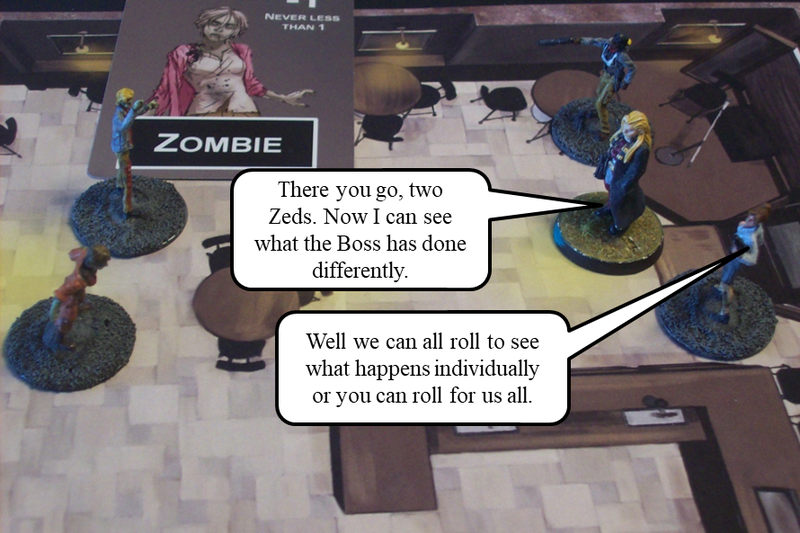 Next, each Leader (6) rolled on the Action Table. Their results would be compared to the opposing group deployed across from them. The Thieves and Dungeon Divers won and would act first. this wasn't a surprise as they had the Advantage. What was a surprise is the Orc choked - passing 1d6 and allowing the Adventurers to act first! The whole human side will act first. The table is set and the Battle Begins! The Battle begins and in order for the Action the Caster s Cast. 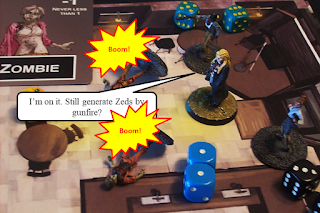 The Adventurers Caster can only fire off a Dazzle spell ad can only affect one target. 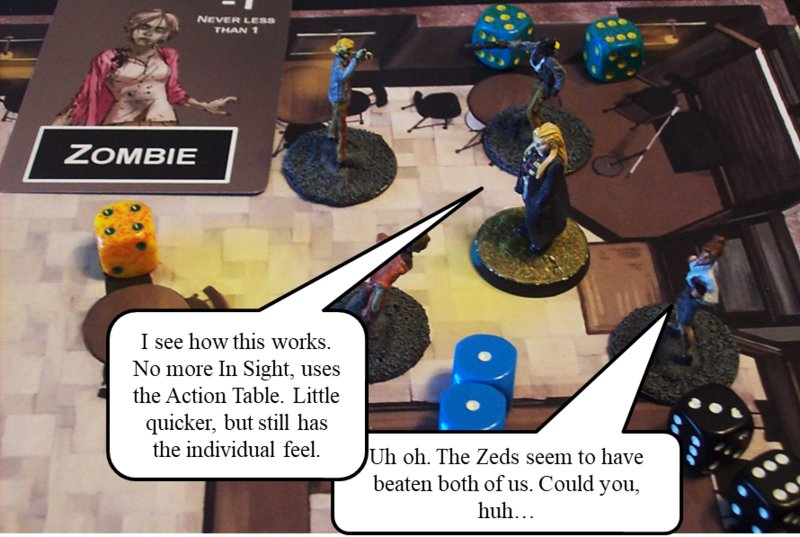 At least she hits the Orc Leader who will ow count a -1 to Rep this and next turn. 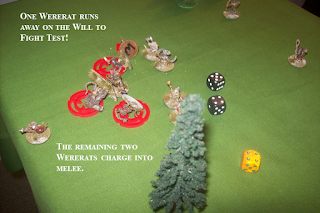 The Dungeon Diver Caster fires off a Damage spell, but can nonly affect one target - he hits and kills the Wererat leader! Red arrows represent the spells cast by the human Casters. Next in order of action is shooting. The two archers fire. One causes the Orc Caster to Duck Back out of sight while the other takes out one Wererat. Green arrows represent archery fire. 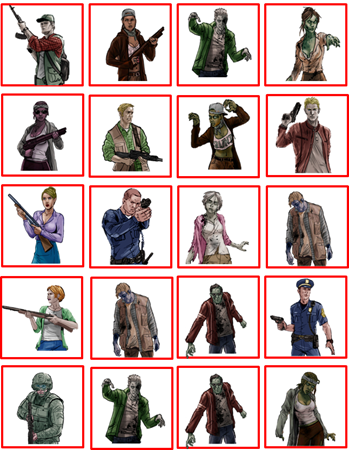 Red splashes are Obviously Dead (large ones) and Out of the Fight. Next on the Action Table, in order is charge and the humans weep forward! The five archers on the Goblin and Orc side open fire at the chargers. 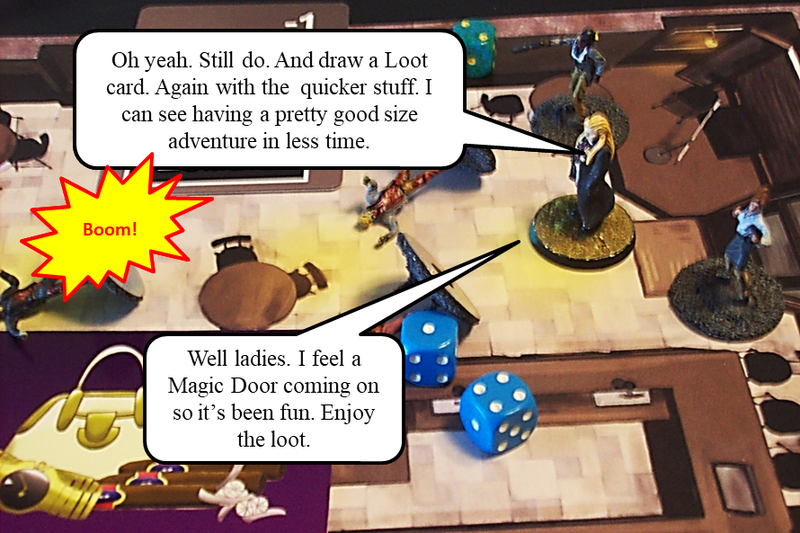 The Adventurers Leader is forced to Duck Back while two humans go down. Green arrows for archery, yellow for ducking back - the Orc Caster and one of the human Leaders. Going down the Action Table makes the game play very quickly and easily to track. melee now happens as the lines collide. Casualties are doled out. Some of the figures don't melee the first time as some of the human groups attack larger enemy groups. 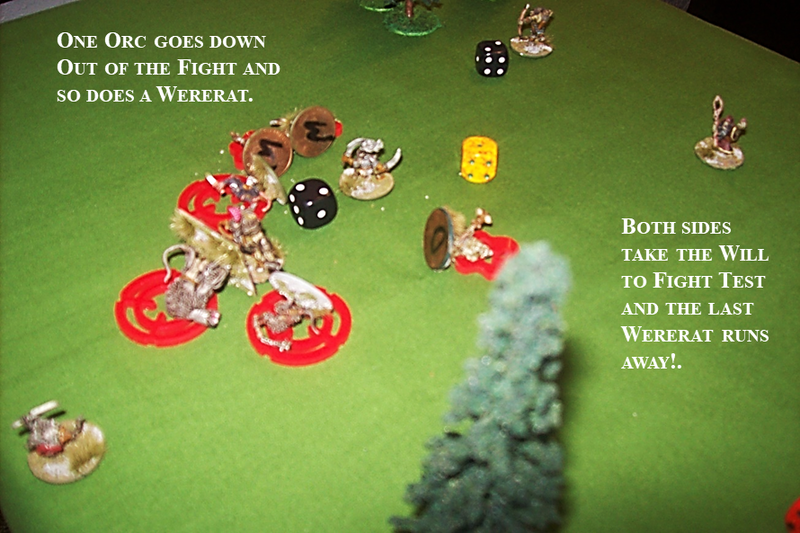 The Will to Fight is taken and Goblin, Wererat and Adventurers suffer losses - figures drift away from the fight. The Caster is one of the first to go! The melee is vicious and the humans are starting to fail. The Adventurers in the center break and flee allowing the Orcs to help the Goblins. 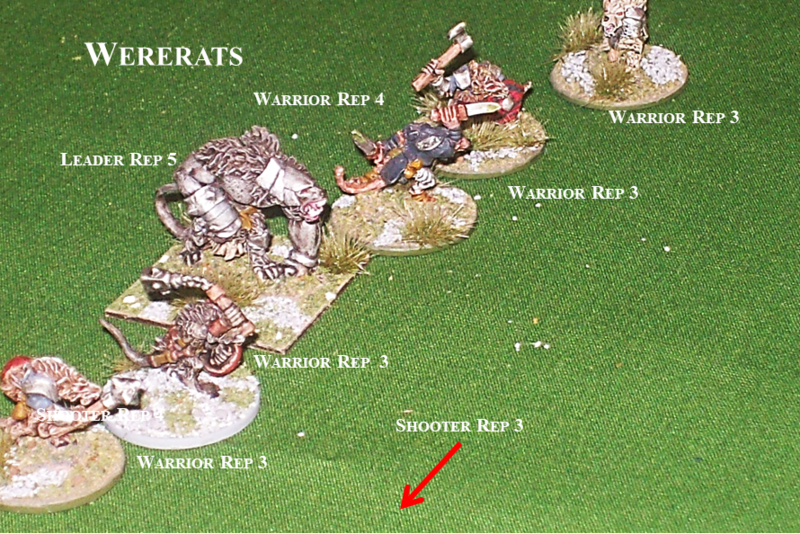 The Orc Caster returns and fires a Damage Spell as the archers pour arrows into the remaining humans. The last of the humans run away and the Orcs are victorious. Time to recover the wounded and take care of the human Out of the Fights. 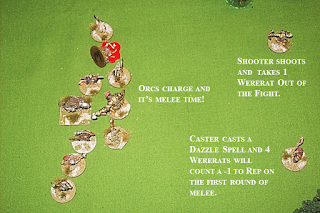 Over all very easy to play by going down the Action Table across the board...all Casters casting, then shooters shooting and finally the melees which took the longest. 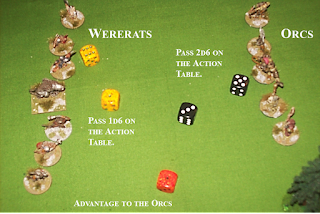 Over all the humand had one turn of action, the Orcs and allies one turn, then the humans a second - breaking at the end due to the Will to Fight Test. Looks like I'll be using this for larger games and campaigning as well. 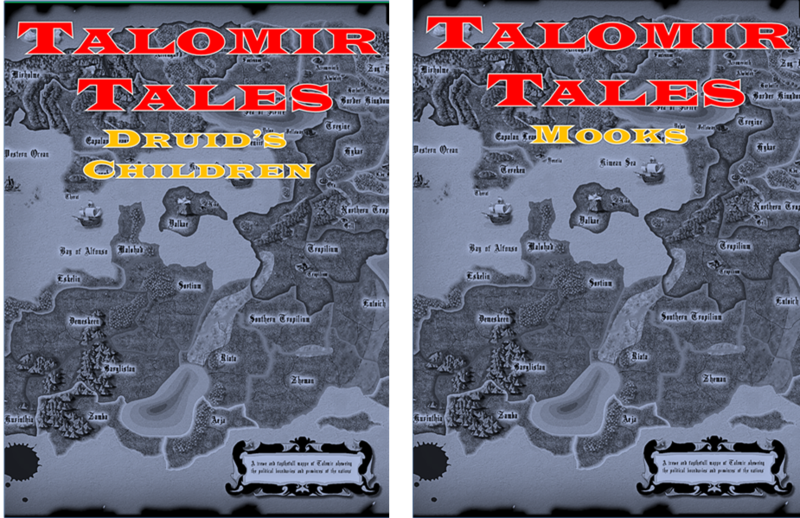 The 5th and 6th Books for Talomir Tales release today! You got a problem with one Orc? Then you got a problem with our whole Tribe! 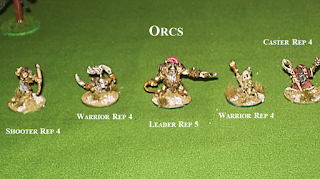 Remember the Orcs? Known for being ugly, stupid mooks used as cannon fodder by the Big Bad? Well, not this time! 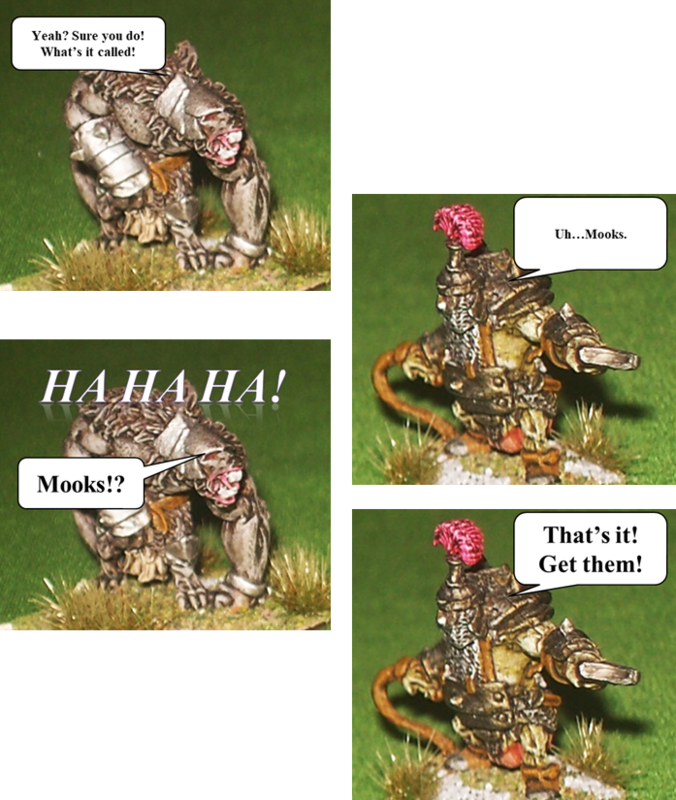 Mooks! This time around the ugly beasts are The Good Guys! Befriend a new race of beings. Check! Stop the Liche Lord. Check! Not all may be as it seems! 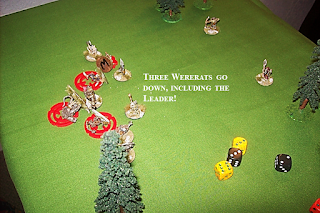 With the release of Mooks and Druid's Children tomorrow, I thought I'd play a game where a band of Orcs run into a Band of Wererats. All minis from Splintered Light . 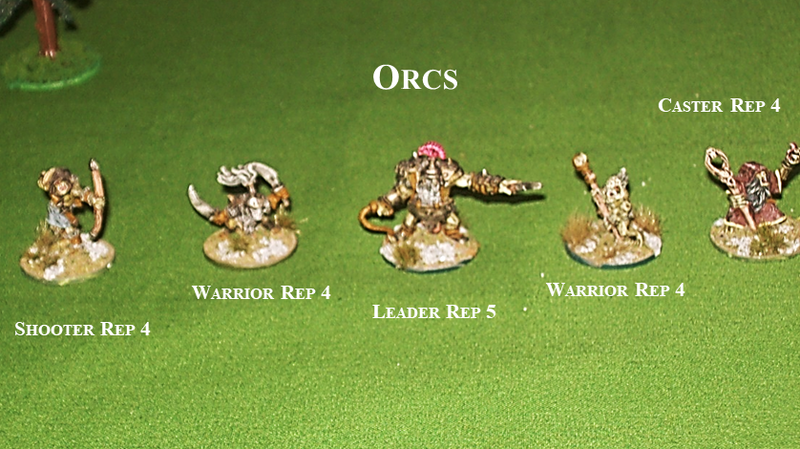 Grug is a Rep 5 Orc Star and he has 4 other Orcs with him - a shooter, a Caster (? ), and two Warriors. Hmm, an Orc Caster - rare indeed, but let's see what he can do...if anything. The Orcs were lucky on two accounts. 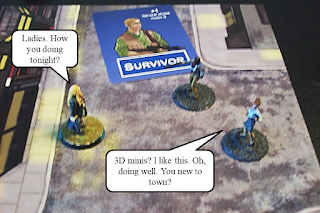 The 1st one being that they won on the Action Table. This allowed them to attack first 5 on 5. 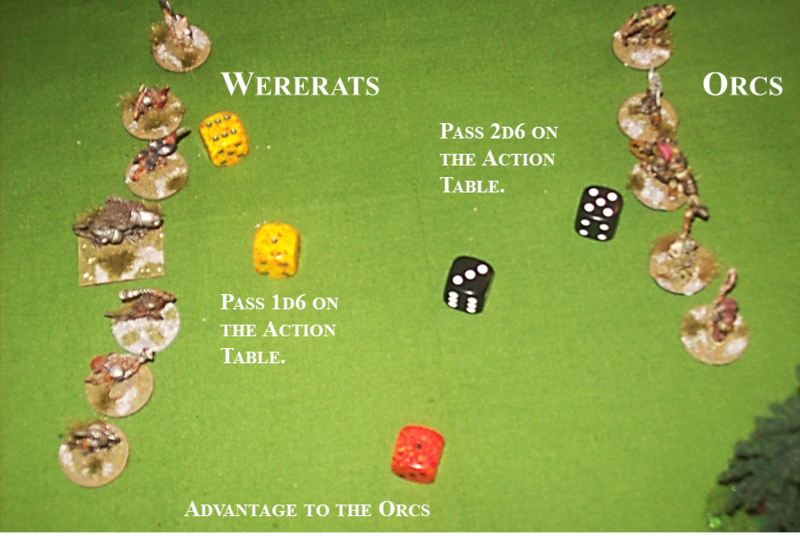 If the Wererats would have attacked first, they would have been able to double up on two Orcs as they had numbers on their side. The 2nd being the Caster got off a successful spell. 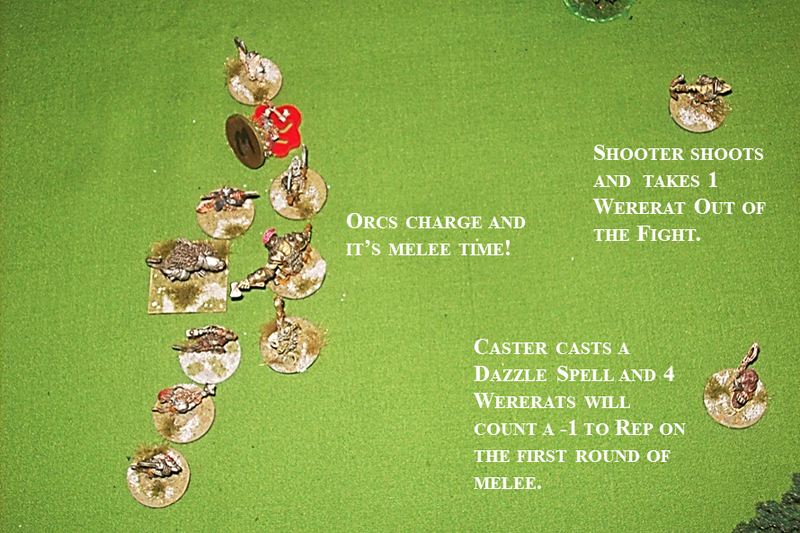 Not the Damage Spell I had hoped for, but the Dazzle Spell helped a lot, reducing the Rep of each Wererat by 1 point in the first round of melee. 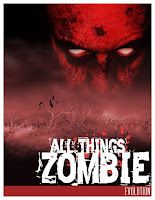 All in all, a fun game. Watch for Mooks and Druid's Children tomorrow. 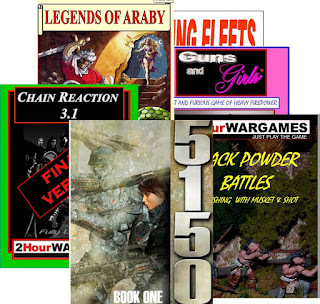 25+ of our out of print old books now on sale as PDFs. * All are either complete rules or scenario books compatible with our current rules. Priced at Free, $5, $7.50 or $10. Something about the bodyguards having their throats slashed without drawing their weapons just didn’t sit right with Pink. Victaii was a sell-sword and he knew of the bodyguards. They had a good reputation and weren’t easily surprised. Maybe Magic or someone had slipped something into their drinks? 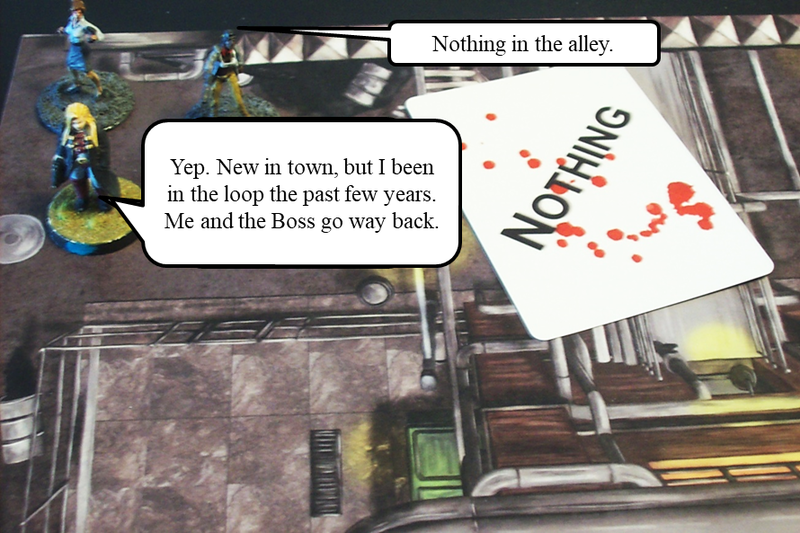 Pink thought it best to start at the Velvet Slipper Tavern where the trio had been last seen. There will be 5 PEFs (Possible Enemy Forces) that can be resolved. Pink only knows that he could run into local Civilians, Altengard Soldiers or Thieve while in the Velvet Slipper Tavern. That is all Pink (and I) know about the Adventure. 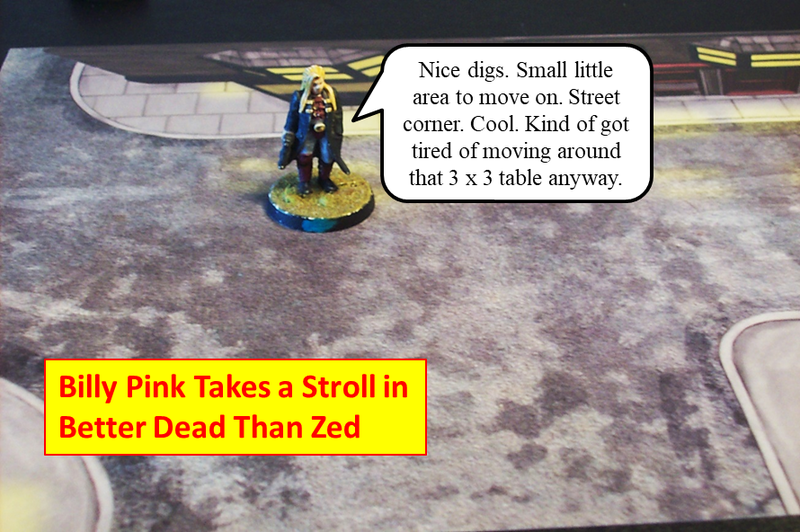 I roll for the Leader’s Random Attribute in case it can influence the Interaction between Pink and the Soldiers. Slippery – it’s a melee based Attribute so no effect. · The Altengard Knight passes 2d6. · Pink passes 1d – less. 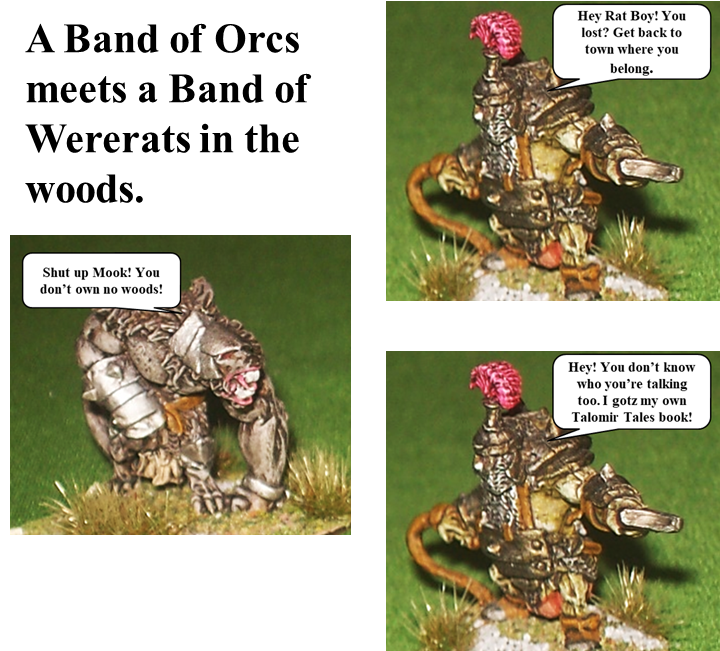 The Knight makes snarky comments about Pink and nothing else. Pink gains 1 Decreasing Rep d6. I roll for the 2nd PEF and score Altengard Soldiers, again. This time Pink only meets 1. The Shooter makes snarky comments about Pink and nothing else. Pink gains 1 Decreasing Rep d6 – that’s 2. I can imagine Victaii smirking the whole time this is going on. I roll for the 3rd PEF and score Altengard Soldiers, again. I figure I’m cursed. Pink only meets 1 Soldier. The Soldier is friendly and says he is looking for a side job if Pink is hiring. I figure recruiting a Soldier would be bad news as he has to report to duty most of the time and would have limited availability. Pink gains 1 Increasing Rep d6 – that’s 1 Decreasing Rep d6 total as they cancel each other out. I roll for the 4th PEF and score Thieves. Pink and Victaii meet two Thieves. 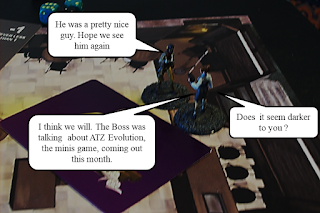 I roll for the Thief Leader’s Random Attribute in case it can influence the Interaction between Pink and the Thief. 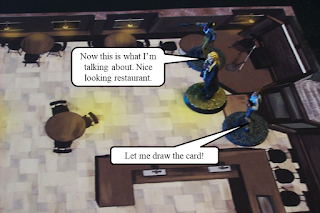 Casting Spells – Interesting, but no effect. 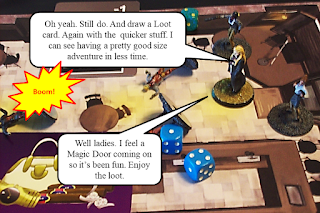 · The Thief passes 1d6. · Pink passes 2d6 - more. The Thief is friendly and says he is wondering if Pink is hiring. This sounds good. Pink gains 1 Increasing Rep d6 – so he’s flush right now. The 2nd Thief is a female. Pink decides to question her as well. Since he got a positive result when interacting with the Leader he can interact with her directly. Pink passes 1d6 more and she gives him 1 Increasing Rep d6 (that's 1 Increasing Rep d6 total) and agrees to be recruited as well. In addition, she says the Duke’s daughter was talking to those “creepy Companions” before she left. Two of them left with her and her bodyguards. The two Companions haven’t been seen since. I decide I’ve done enough and end the Encounter. 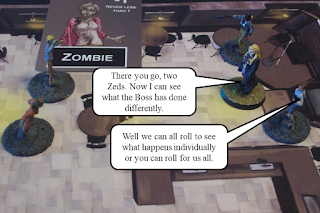 I roll the 1 increasing Rep d6 and score a 2 – nothing. 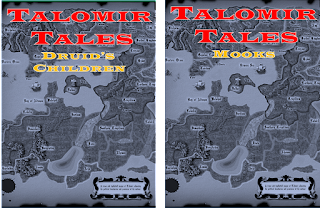 Talomir Tales - The City Below Bat Rep - Part One. 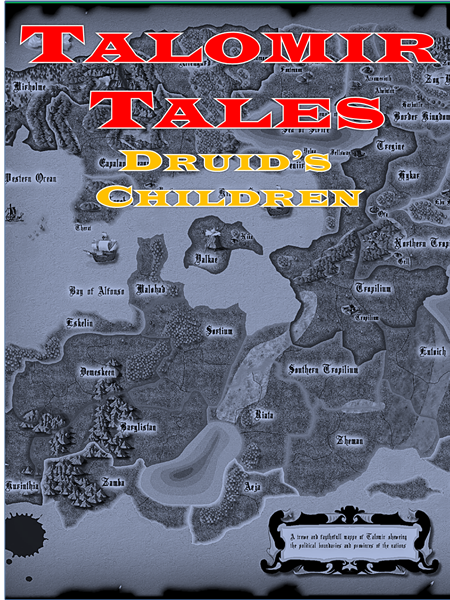 With the upcoming release of two more Talomir Tales scenario books - Mooks and Druid's Children - I wanted to do some Talomir Tales gaming. I went for the City Below. Here's the nice thing about THW games. Even though I'll go through quite a few of the Encounters, my results may not be like yours as no two games ever play out the same. These will be in depth reports to describe game play as well as what's happening during the games. My personal Character is William “Billy” Pink AKA Pink for short. Here are his stats and those for Victaii, the only current member of Pink’s Band. · Star or a Grunt? Star. · Race? Men – Altengard. · Armor Class? AC 2. · Star or a Grunt? Grunt. · Race? Men – Mirholme. Pink starts the Adventure with Victaii. He can cut him loose anytime he wants. Don’t feel bad about that, because Victaii’s Rep is the same as Pink’s; if Pink’s Rep drops, Victaii will leave anyway! 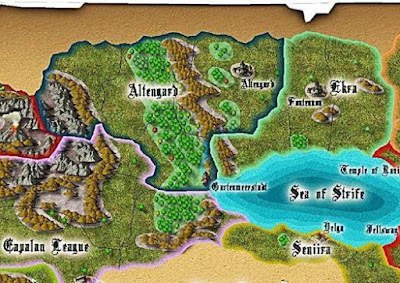 The Duchy of Altend in eastern Altengard, along the border with Ekra. It didn’t take long for him to find out. Pink’s friend, the Captain of the Watch, has contacted him and requested his help. 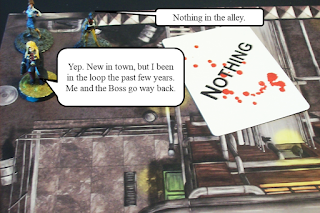 The daughter of the Duke has disappeared and her two bodyguards killed. He wants Pink to quietly seek information about what happened and where she may be. Quietly, as the Captain of the Watch can ill afford to be linked to Pink, a member in good standing of the local Thieves Guild. A map of where the Adventure takes place. Last few days, check it out! 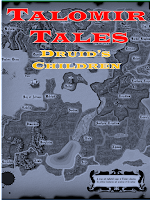 Druids Children! Befriend a new Race of beings and try and stop the the Liche Lord. All that and free ale in the Eastern Border Kingdoms of Talomir. Mooks! What happens when the Orcs are the Good Guys!? 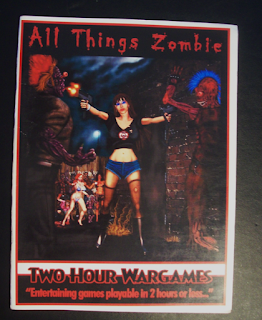 If you do, email me at twohourwargames@gmail.com. 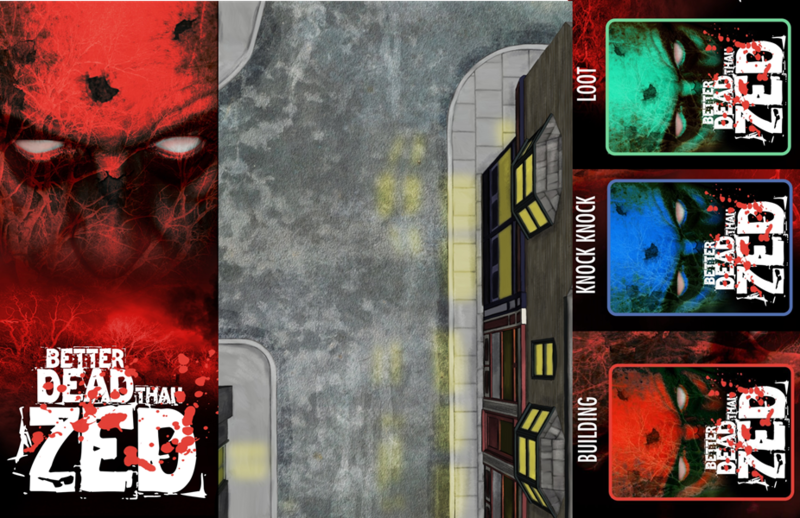 Play it on the Tabletop, play it on the Battle Boards; with minis (even those cool ones from other games) or counters. 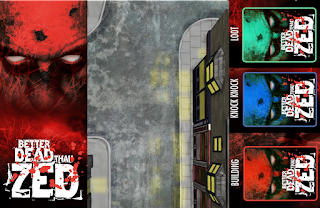 Basic set includes 2 Battle Boards and 20 counters to get you into the game ASAP. 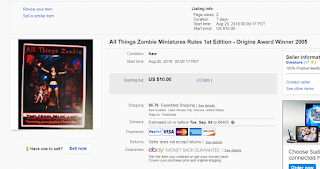 Option to buy the rules and get the 20 counters and all 12 Battle Boards as well. Heck, you can even buy the Battle Boards separately! 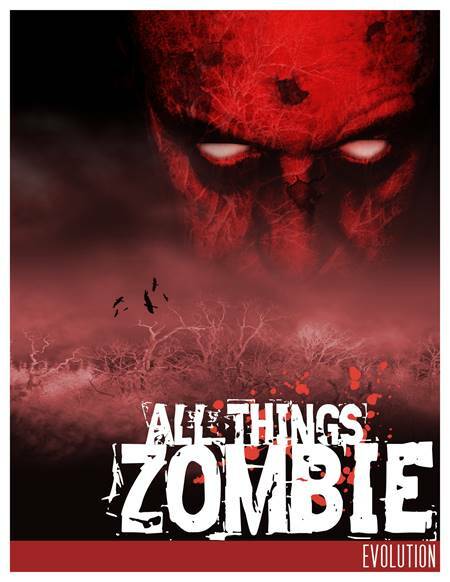 Mint 1st Edition All Things Zombie Found and NOW for Sale! Not sure if there's any interest , but found a mint copy of the Origins Award Winner while rummaging for something else - LOL. Only two mint copies that I know of and I'm keeping one. 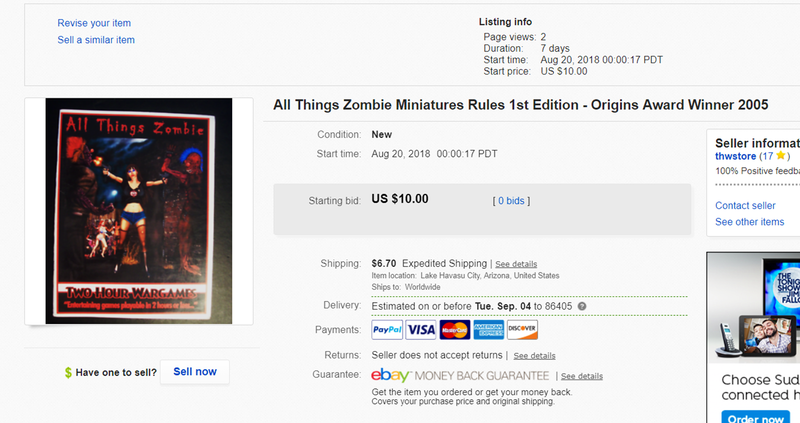 Ebay Auction starts Monday 12AM and runs for seven days. This one goes live tomorrow. 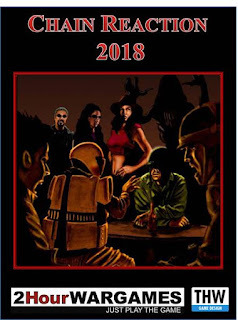 Chain Reaction 2018 Meets Chain Reaction 2015! We're back! 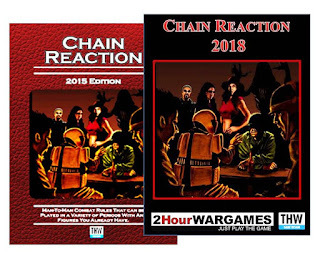 Chain Reaction 2015 now available again! Chain Reaction 2018 is played on an 8" by 10" Battle Board. Chain Reaction 2015 is played on a 3' x 3' Tabletop. 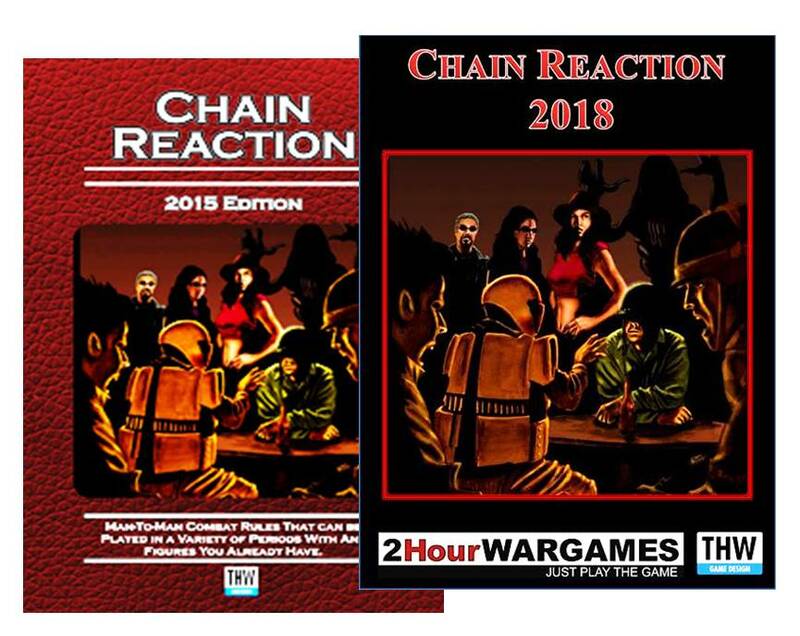 Chain Reaction 2018 has all the action in one spot - the Battle Board. Chain Reaction 2015 let's you move your troops over the table, in and out of terrain, shooting from table edge to table edge. Play either way or play both, as they are totally compatible. All Things Zombie - Evolution - Final edits are in! Final edits on ATZ Evolution are in and look for a release next week. 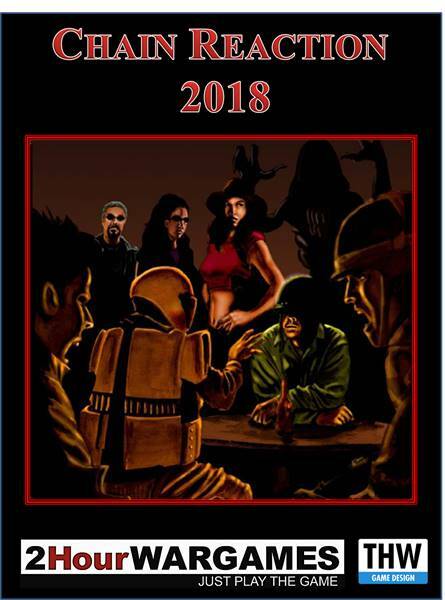 Speaking of release, Chain Reaction 2018 out this week. 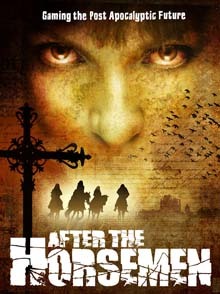 Holy crap - first came out in 2002! Like our other games we're updating them to what people want. Streamlined mechanics, more action in shorter time. String together a few adventures in one sitting and build your Story! ATZ Evolution/Better Dead than Zed - Bat Rep and How To. Who better to explain the differences than Billy Pink whose been around for 13 years! 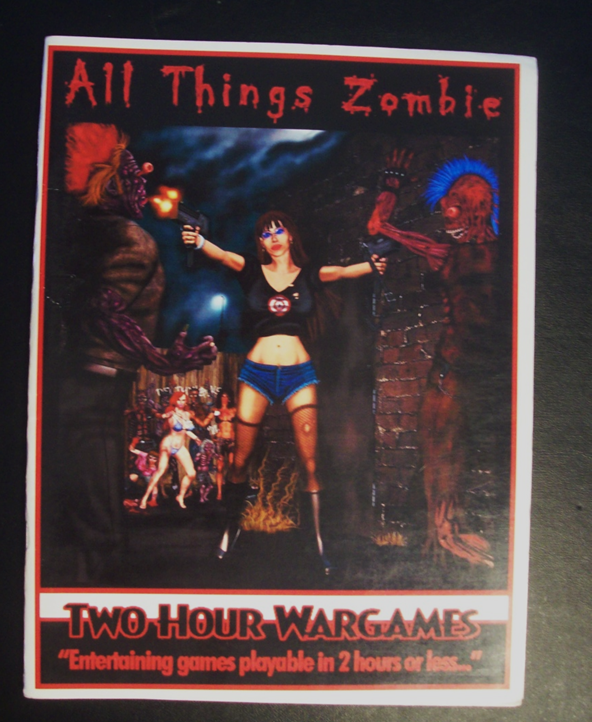 Want the Board Game Version? Glad you asked.